rec. Hochschule für Musik und darsetellende Kunst, Frankfurt a.M. Germany, 4-6 January 2007. DDD. Why have I had this CD so long without committing my final thoughts on it? First of all, I got bogged down by the question ‘What exactly do we mean by Vivaldi’s ‘complete’ recorder concertos?’ Skip the next paragraph if you don’t want to give yourself a headache. The issue is not nearly as cut and dried as CPO would have us believe. Hyperion offer the same six concertos (RV441-5 and RV108) on CDH55016 (Peter Holtslag/Parley of Instruments/Peter Holman) and Naxos also offer a collection entitled Complete Recorder Concertos with RV441-5, plus RV95 (8.553829 – see review), but Naxos also have a completely different collection on a CD entitled Recorder Concertos (8.557215): RV 103, 92, 105, 94, 108, 87, and 101 (see appreciative reviews of 8.557215 by Adam Binks and Glyn Pursglove). Harmonia Mundi offer a budget-price 2-CD set of Flute and Recorder Concertos (HMX290 7340.41) on which RV104 (La Notte) and RV433 (La Tempesta di Mare) plus RV 434 and 435 are included as recorder concertos as well as RV441, 443 and 444 in common with this CPO recording. I could also have got bogged down in the issue of exactly what a flautino was, the designated instrument for RV443-5, but I’m going to avoid that particular Slough of Despond. I’ll simply say that these concertos sound well on the recorder. Then there’s the quality of the music. 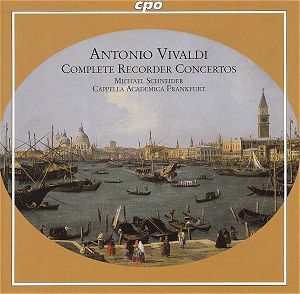 I love Vivaldi and vehemently reject the old chestnut that he composed the same concerto hundreds of times, but I have to admit that 67 minutes of recorder concertos do tend towards the monotonous; even though three different solo instruments are employed here and concertos for flautino and alto recorder alternate, there isn’t much variety. This is all attractive music but, as one reviewer of the Hyperion CD wrote when it was first issued, these concertos are hardly Vivaldi’s most absorbing works – it’s hardly surprising that Harmonia Mundi have ‘borrowed’ two very striking flute concertos, La Notte and la Tempesta di Mare for the recorder component of their 2-CD set. I came back to this CPO recording immediately after hearing Linn CKD151 on which the various members of the Orchestra of the Age of Enlightenment perform eight Vivaldi concertos for different soloists or combinations of soloists. The performances on CPO are certainly worthy to be mentioned alongside that superb Linn CD, with Michael Schneider’s solo playing just as winning as that of Lisa Beznosiuk on Linn in the other La Notte concerto, RV439. With Petra Müllejans as first violin, the support of the Cappella Academica, Frankfurt, could hardly be bettered and the CPO recording is also very good. I must, however, honestly report the much greater power of a varied collection such as that on Linn to hold my attention – and there is plenty of music from the flute-recorder family on that CD if that’s what you want: the Concerto in d for 2 recorders, 2 oboes, bassoon and 2 violins (RV566), the Chamber Concerto in g for flute, oboe, bassoon, violin and continuo (RV107) and the performance of La Notte (RV439) which I’ve already mentioned. Full marks, too, to Linn for a Vivaldi CD with a striking cover that doesn’t include a Canaletto painting. My personal favourite among the concertos on the CPO disc, the charming Concerto for alto recorder, RV442 (tracks 10-12), does make me sit up and take notice, as does the slow movement of RV443 (track2). Like everything here, these are well performed and recorded; they would have stood out even in the company of a mixed programme like that on Linn, which is where I’d have preferred to hear them. Tempi throughout both the CPO and Linn CDs are lively but never breakneck, as some recent performances of Vivaldi and his contemporaries by Italian ensembles have been. I haven’t heard the Naxos or Hyperion Helios CDs but they have both received very favourable reviews: See links to MusicWeb review of the Naxos CD above. The Naxos CD omits RV86 but includes RV95 in compensation and is available for less than half the price of the CPO, as also is the Hyperion. The latter programme is shorter by about six minutes than either the Naxos or CPO but comes with a Hyperion booklet which includes the usual first-class notes – check it out on the Hyperion website – and varies the programme somewhat by employing a chamber organ as continuo in some of the concertos. If you just want a single CD of these concertos on period instruments, this Helios would seem to be your best bet. The Harmonia Mundi set, too, is attractive, offering both recorder and flute concertos on two CDs for the price of the single CPO disc. Janet See’s versions of the Flute concertos RV427-9, 436, 438, 440 and 533 with the Philharmonia Baroque Orchestra/Nicholas McGegan have been a valued part of my collection since they were first issued in 1988 on HMU90 5193, so I can at least confirm the excellence of half of this set. I have no reason to think less well of the second CD on which Marion Verbruggen performs with the same orchestra and conductor; I’ve already endorsed her performance of RV95 on another, very inexpensive, Harmonia Mundi Classical Express CD (Seven Chamber Concertos, HCX395 7046 – see review). Now, perhaps, my reasons for taking so long to finalise this review become apparent. There’s absolutely nothing of any importance that I can find to say in criticism of the present CPO performances and recording, yet I find myself unable to recommend the CD wholeheartedly when there are such inexpensive alternatives and when I think that most listeners would really prefer the kind of mixed Vivaldi programme to be found on the excellent Linn and Harmonia Mundi Classical Express CDs to which I’ve referred. While I’m about it, let me reiterate my recommendation of another Linn recording of Vivaldi, mentioned in my March 2009 Download Roundup (Elvira, Cantatas and Sonatas, CKD281 – see Robert Hugill’s review).